I first talked to Bobby in November 2006 during a phone interview about Marty Robbins. We met in person as authors at a book festival in Nashville the following October. He had just published his memoir, Down in Orburndale: A Songwriter’s Youth in Old Florida. I had Live Fast, Love Hard: The Faron Young Story. We met again when he attended my 2012 book release party for Twentieth Century Drifter: The Life of Marty Robbins. The first two songs Bobby had recorded in Nashville were by Marty. “When that happened,” Bobby told me, “I thought maybe I am a songwriter. Maybe I really am.” Yes, he really is. He was inducted into the Nashville Songwriters Hall of Fame in 1984, the Country Music Hall of Fame in 2011, and the Songwriters Hall of Fame in 2015. To find out what he’s doing now, I decided to contact him. He took time from an evening of songwriting last night to have a 40-minute phone conversation with me. He has just finished his third book and is working on finding a publisher. Although he gave me the title and description, he doesn’t want the information released yet. He said the book is about classic country songs—how they’re written and the stories behind them. Each song will include an illustration and a narrative. I am looking forward to this book being published. The concept intrigues me. I asked if there was a story behind writing “People Are Crazy.” He said a friend had set him up to write with Troy Jones. They first met when they walked into the room to write together. Troy had the line, “God is great, beer is good, and people are crazy.” They finished most of the song and then got stuck. Bobby suggested, “Why don’t we have the younger man inherit his wealth, instead of his kids?” Bobby considers they each wrote 50 percent of the song. “That was my initial meeting with him,” Bobby told me. “We walked into the room and started writing.” He recalled a similar situation years earlier. “I did that in the 1980s with John Prine,” he said. On the day they met, they turned out “Unwed Fathers.” Although never a hit, it’s been recorded numerous times. Tammy Wynette recorded it and John sings it on his shows. Bluegrass Today reports the death of a bluegrass mandolin legend. Dean Webb of the Dillards died June 30, at age 81. He was playing mandolin in Missouri in 1962 when he joined Doug (banjo) and Rodney Dillard (guitar). From 1963-66, the Dillards made six appearances on The Andy Griffith Show as the Darling Family. The Dillards became one of the first bluegrass bands to electrify their instruments. They influenced the development of southern California folk/country rock styles. Ralph Stanley: Voice From On High is the name of a new exhibit opening at the Country Music Hall of Fame and Museum on July 13. It honors Ralph Stanley, who died a year ago at age 89. His bluegrass band, the Clinch Mountain Boys, gave both Ricky Skaggs and Keith Whitley their start on the road to musical fame. The exhibit will run until January. “Music Row’s last true songwriter venue and dive bar Bobby’s Idle Hour has become the latest landmark on Nashville’s Music Row to come under threat from proposed redevelopment,” reports Saving Country Music. Panattoni Development Company wants the lot for a new office building. Some of Music Row’s landmarks have been saved, such as Studio ‘A’ and Studio ‘B,’ but others are being threatened. In an attempt to help preserve the remaining landmarks, The National Trust for Historic Preservation has begun giving guided walking tours of Music Row. The tours are conducted in partnership with Let’s Go Travelin’ Tours and Historic Tours of America’s Old Town Trolley Tours. The tours begin at Bobby’s Idle Hour, from which tour guides lead the 90-minute walking tour. The tours help educate the public about the historical significance of the area and some of its most important landmarks. A portion of ticket sales will go to the Music Row Preservation Fund. “Are the Dixie Chicks Working on New Music?” asks Sounds Like Nashville, after Natalie Maines has been posting teaser photos on her Instagram page. A new record would be their first since 2006, although they did create a live album, DCX MMXVI Live, after touring the United States in 2016 on their DCX MMXVI World Tour. Diane: Congratulations on becoming a published author, Chief. We captains are always pleased to hear our leadership examples have provided a positive influence. Diane: I did a phone interview with Billy Walker in 2000, for my Faron Young biography, and I had my picture taken with him backstage at the Opry. Other than that, I don’t have any info. He died before I had a chance to talk to him about Marty’s biography in 2006. Diane: Readers? Any familiar names here? The second and third Statler Brothers tunes (after “Flowers On the Wall) to hit the Top Ten, both in 1967, were novelty tunes written by Bobby Braddock. The first was “Ruthless”: “I had hopes that someday Ruth would be my wife, but it looks like I’ll be ruthless all my life.” The second was co-written with Curly Putman, “You Can’t Have Your Kate and Edith Too.” I have always liked those clever tunes, as I like pretty much any Statler Brothers music. I didn’t realize until now that they both came from the Bobby Braddock catalog. Before Disney World took over Central Florida, there were small towns surrounded by orange groves. One of those was Auburndale, halfway between Orlando and Tampa. That was the hometown of Bobby Braddock, who tells his early life story in the 2007 memoir, Down In Orburndale: A Songwriter’s Youth In Old Florida. From a little boy who got more than his share of spankings, who realized he learned piano better by listening to records than through music lessons, and who wrote his first song at age five, he grew into a teenager who lived the life portrayed in Happy Days. By age 18, he was playing in bands and traveling throughout the region. The book ends with Bobby and his bride on the road to Nashville in 1964. 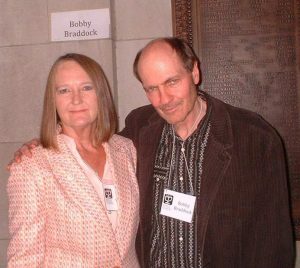 His follow-on book is Bobby Braddock: A Life on Nashville’s Music Row, published in 2015. Born in Texas in 1928, Jimmy Dean moved to Washington, D.C., in the mid-1940s to his duty station at Bolling Air Force Base. There he formed a band to entertain fellow servicemen and continued performing after his discharge in 1948. Soon he was the star of Connie B. Gay’s Town and Country Time TV show. From 1963-1966, he hosted The Jimmy Dean Show on ABC-TV. His biggest hit song came in 1961, “Big Bad John.” He appeared on numerous TV shows, both as an actor and as guest host on talk shows. Ads for Jimmy Dean Sausage increased his fame among non-music audiences. He died in 2010 at his Virginia home, shortly before his 82nd birthday and Hall of Fame induction. Ferlin Husky, born in 1925, grew up on a Missouri farm. After Pearl Harbor, he enlisted in the Merchant Marines. D-Day found him on a troop ship off the beach at Cherbourg, France, serving as a volunteer gunner. Returning stateside, he sang in St. Louis night clubs before moving to California. There he appeared on Cliffie Stone’s Hometown Jamboree radio and TV series. Ken Nelson signed him to Capitol Records in 1953 and urged him to return to his real name. He had been performing as Terry Preston. Ferlin and Jean Shepard hit big with “A Dear John Letter” that July. Ferlin moved to Springfield, Missouri, in 1955 to join the Ozark Jubilee and later to Nashville and the Grand Ole Opry. Other major hits included “Gone” and “Wings of a Dove.” As his alter ego, Simon Crum, he had a 1959 hit, “Country Music Is Here to Stay.” After co-starring in several movies, he was awarded a star on the Hollywood Walk of Fame in 1960. A few months after his induction into the Country Music Hall of Fame, Ferlin Husky died on March 17, 2011, at his home in Hendersonville, Tennessee. He was 85. One of the most influential producers of the 1970s, Billy Sherrill brought a broad musical background to country music. Born in Alabama in 1936, he attended the revivals of his evangelist father and eventually worked in R&B and rock bands. After moving to Nashville, he and Glenn Sutton wrote “Almost Persuaded,” and he produced the number one hit for David Houston. The recording won them three 1966 Grammy awards. Billy gained a reputation for his lush productions with strings and background vocals, even on basic country songs. He closely guided the career of Tammy Wynette from its beginning, with “Your Good Girl’s Gonna Go Bad” (co-written by Sherrill and Sutton). He produced 39 top ten hits for her, with 20 of those reaching number one. He also produced Tammy Wynette – George Jones duets such as “We’re Gonna Hold On,” “Golden Ring,” and “Two Story House.” When he began producing solo hits for George Jones, the songs included the Sherrill/Sutton “We Can Make It” and the Bobby Braddock/Curly Putman tune, “He Stopped Loving Her Today.” Billy was named Vice President-Executive Producer for Columbia-Epic’s Nashville office in 1980. He was elected to the Nashville Songwriters Hall of Fame in 1984. He also produced and wrote songs for Johnny Cash, Janie Fricke, Marty Robbins, Joe Stampley, David Allan Coe, Johnny Paycheck, Tanya Tucker and others such as Ray Charles and Elvis Costello. Billy Sherrill died in Nashville on August 4, 2015, at age 78. Don Williams, long before becoming the “Gentle Giant,” won his first talent competition at age three. The prize was an alarm clock. Born in 1939, the young Texan learned guitar from his mother. He graduated from high school in 1958 and served two years in the US Army. He was a member of the folk-pop trio, the Pozo-Seco Singers, in the 1960s before moving to Nashville. There, Jack Clement signed him as a songwriter. When he began recording, his first number one record was “I Wouldn’t Want to Live If You Didn’t Love Me.” The string of fifteen Top Ten hits that followed included “Tulsa Time.” He won fans worldwide, selling records in the British Isles, Europe, Latin America, and Australia. He is one of the few country stars who toured in Africa. He headlined the annual Wembley international festival, toured Britain and mainland Europe, and sold LPs by the hundreds of thousands. In 1980, London’s Country Music People magazine named him Artist of the Decade. He was known for dressing in faded blue jeans, denim jacket and a worn-out hat, which he first wore in the 1975 movie, W.W. and the Dixie Dancekings. He was too ill with bronchitis to attend his 2010 induction into the Hall of Fame. Don Williams retired from touring in 2016. He died on September 8, 2017, at age 78. This entry was posted on Wednesday, July 11th, 2018 at 9:23 am	and is filed under Newsletter. You can follow any responses to this entry through the RSS 2.0 feed. Both comments and pings are currently closed.